Shower trailers can be used for a variety of different applications including: disaster relief, emergency response, military training, industrial outages, government projects, festivals and filming events. 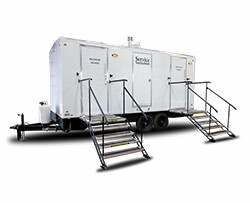 Service Sanitation currently has a large inventory of mobile shower trailers available for immediate rental. The 4-stall combo trailer conveniently brings together versatility and privacy. 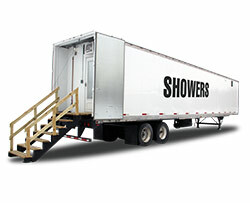 This 8-stall shower trailer is perfect for small to medium size rental applications. 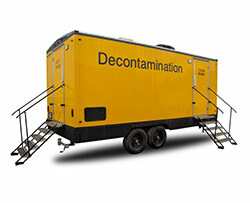 OSHA compliant, this decon trailer safely removes hazardous contaminants. This high-capacity shower trailer is ideal for large-scale events and disaster relief applications.